Hotels have lost much of their ancillary revenue from me over the last few years. With unlimited roaming plans in the U.S. and the ease of buying prepaid cell service overseas, I only use hotel phones for wake up calls and room-to-room calls. With EV-DO, they’re likely to lose revenue from their overpriced Internet access as well. I’ve been using Sprint’s Mobile Broadband as I’ve been traveling over the last two weeks. I get unlimited data access for $60 a month. In hotel rooms. With 8 hotel nights this month, I’ve saved $80 in hotel Internet charges, based on the hotels’ relatively reasonable rates of $10/night. (I’ve paid as much as $35 per night.) More importantly, I don’t have to worry about whether the hotel network works. Many hotel networks are run by off-site companies; if you have a problem you’ll get blank stares from the front desk. On Acela. With EV-DO, I can work on the 2 hour 45 minute trip to New York. The coverage is spotty, dropping to the slower (dial up speed) 1XRTT standard at times. Although it roams seamlessly to 1XRTT, it doesn’t seem to transition back automatically. I also found myself roaming on Verizon’s 1XRTT network; I might have better luck with Verizon’s service. Verizon and Sprint have free roaming on their 1XRTT networks, but not on EV-DO. At the Web 2.0 Expo conference. I’m writing this blog post in between sessions. While much of the audience here is having trouble using the conference Wifi network, I’m able to get online without any problems. Mobile broadband is somewhat of a misnomer. 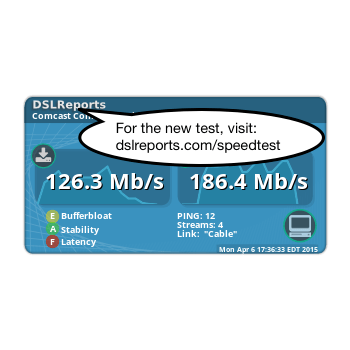 It is slower than most broadband connections; it’s about as fast as the slowest home DSL connections. I would estimate the typical speed I’ve gotten is 250kbps down/100 kbps up on Sprint’s Revision A network. This is less than the “typical” speeds advertised and well under the peak speeds advertised. The image below is an actual speed test from my laptop. You won’t be able to watch TV-quality video from your Slingbox, but the speed is good enough for most business applications. The one downside is that as with most products offered by wireless carriers, you have to sign up for two years. By then, you’ll be wanting a Wimax connection. Blast from the past: Sprint’s Stick it to the Man ad. This entry was posted in wireless, wireless data. Bookmark the permalink. Amen! I’ve been tethering with a Sprint PAM (phone as modem) plan for 2 years now with my notebook and PDA. At conferences, while everyone in the room is complaining that they can’t get on the public wifi, I just hop on the Sprint EV-DO network with no hassle. Same with Internet usage at hotels. By the way, IMHO tethering is a much better option than the data cards. PAM does not require a 2-year contract, and you can connect the phone via USB or Bluetooth to desktop PC”s that don’t have a PCMCIA adapter or even PDA’s. Tethering is a good idea, too. But many phones (including mine) aren’t Rev. A capable, which means you’ll get slower speeds. In my experience, the speed difference between Rev. 0 and Rev. A isn’t as great as advertised. If you don’t need to talk and surf simultaneously, tethering is a great alternative.